The little black dog is hunkered over, trembling. 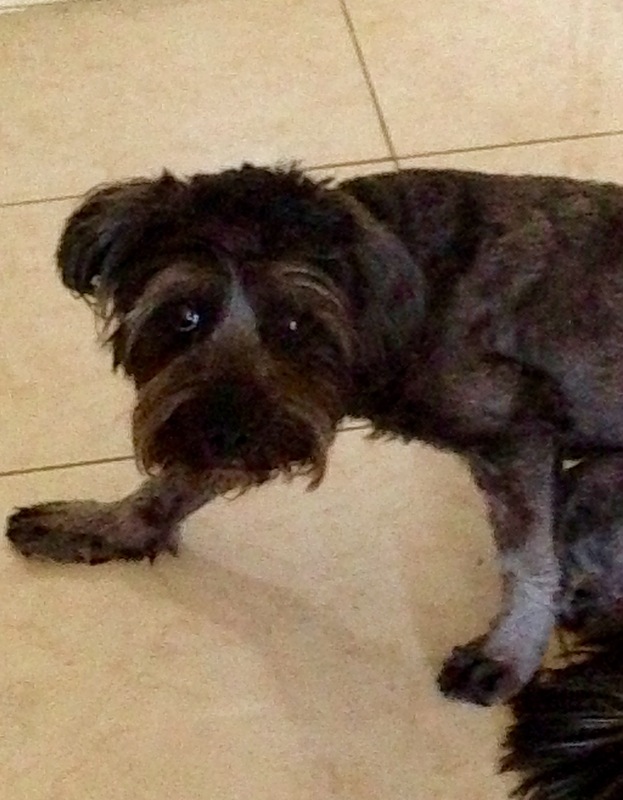 She’s a naked waif in her new summer haircut that’s removed every vestige of dignity, and with the shaking, she’s pathetic in the truest sense of the word. The little black dog, Coconut, cowers from fright at the noises. Why is she trembling so? Because the Neighbors on the Right (of the house where I’m housesitting) have started shooting firecrackers, and the delicious (to me) smell of sulfur filters in the window. 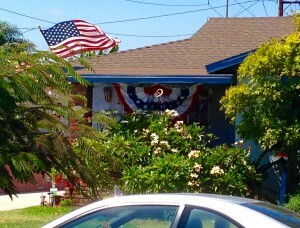 I don’t know if it is legal to shoot fireworks in Hawthorne City proper, but this house is in Wiseburn, a little unincorporated entity that has its own regulations (or lack thereof) and even its own school district. It’s a proud, independent little enclave in the middle of massive Greater Los Angeles—a unique place to spend the Fourth of July. A pause. Now there are more popping sounds; more sulfur. And oh no, the big barley-colored dog, the dog I thought was experienced and tough, pukes on the rug, twice. I clean it up with a rag. He looks pale…is it possible for dog’s fur to become pale from fright? Barley resting after losing his stomach on the rug. 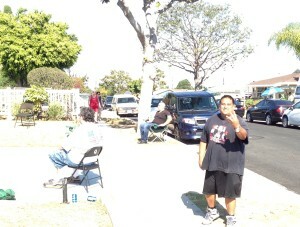 Then Neighbor on the Left is singing again. He’s got a nice voice that’s amplified up and down the street. He’s a single father, raising two boys. His friendly wave, as I snap a picture while he’s crooning into the mike, reiterates the invitation he offered yesterday that I should “come on over.” There’s a smattering of applause as he finishes. The audience for the band, the seated audience, numbers two, plus one bystander. I wonder how many sets they’ll play. Not that I mind…I just wonder how much energy they’ll have, how long their voices will last. 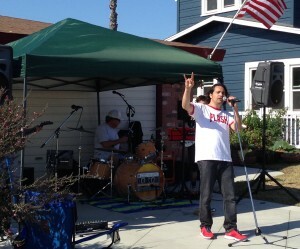 Neighbor on the Left, performing with his band. Three viewers, to start. Things picked up as the evening progressed. 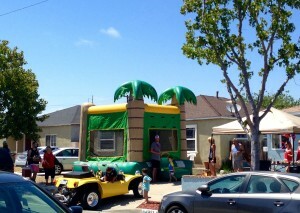 By mid-afternoon, the smell of hamburgers grilling begins to compete with the sulfur. This morning, I was up early as usual, walking the dogs about 6:30am. 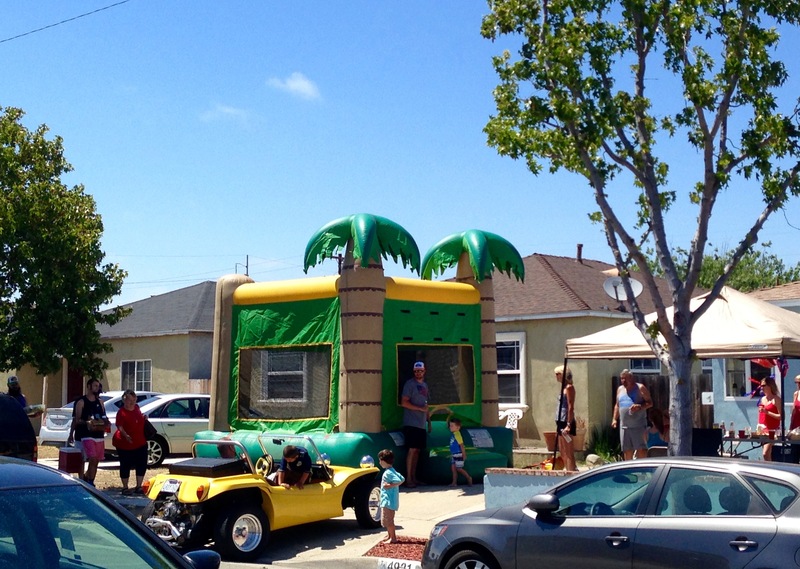 Already the Neighbor on the Right had a crew of friends setting up canopies to cover what I imagined would be end-to-end tables mounded with great Mexican food. 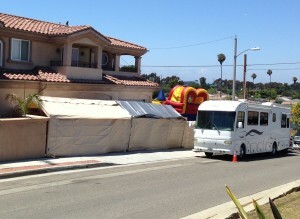 Also, the crew blows up a couple of impressive bounce houses to accommodate the kids who will visit. Lots of Spanish drifts in the window. Gotta love America! What a grand country! 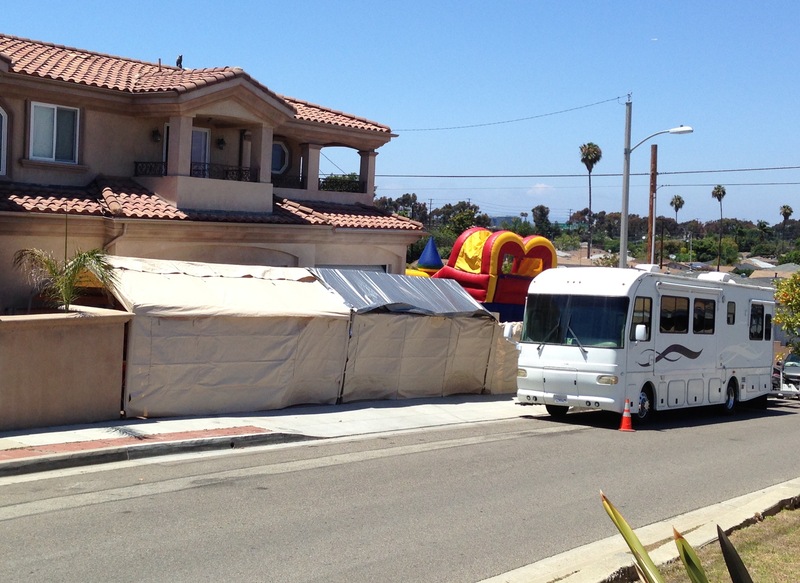 Neighbor on the Right sets up canopies to accommodate a large crowd of celebrants. There was cloud cover over Wiseburn until about noon, which made for a wonderful temperature all day with the wind off the ocean which reaches all this way inland. Thank goodness. Up and down these blocks, flags whip around in the wind. 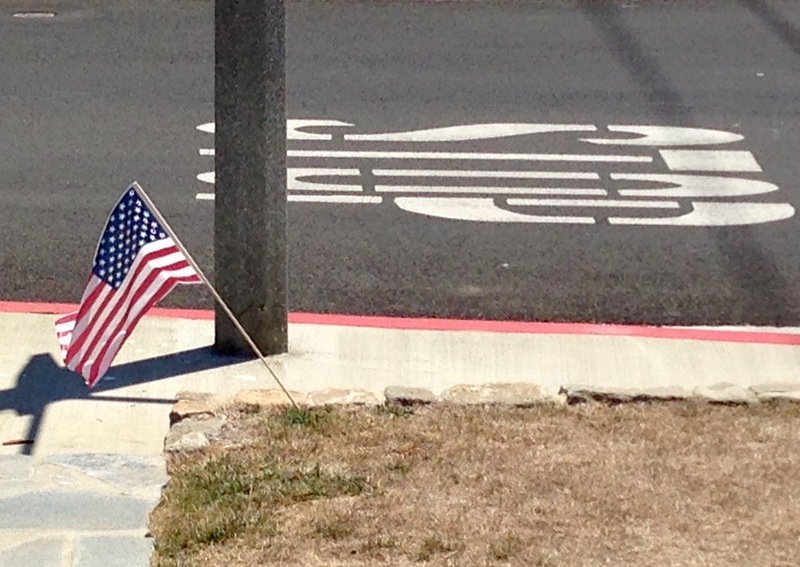 A local real estate person has placed American flags on every lawn. It looks nice. Flags were placed in front of every house—accompanied by ads for the local real estate agent. 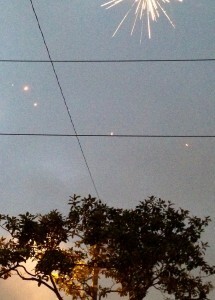 As I walked the dogs in the early morning, I discover a fair number of people gussied up their homes in red, white, and blue, or planned other outdoor celebrations. Gradually, residents and their guests begin to gather on browning lawns, eager to create celebration even in the midst of this great California drought. Now, oh, oh. A loud noise. The dogs are scrunched at my feet. The little one trembles still more. Soon, another loud noise. They snap their heads around to locate the source. The little one creeps farther under the table and sits on my toes. Later: It’s 8:00pm. It’s finally getting dark outside. Fireworks start in earnest. 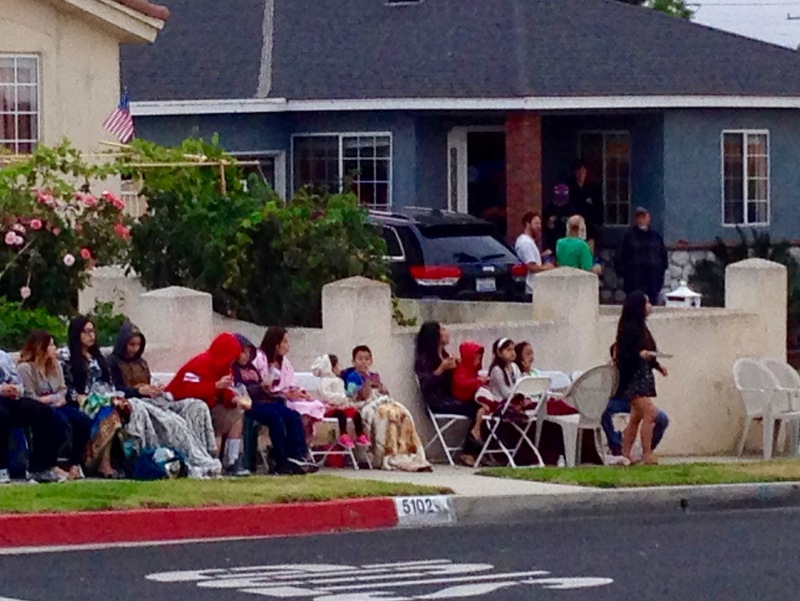 Kids and parents swarm about on lawns and into the streets. Cars drive slowly, carefully. 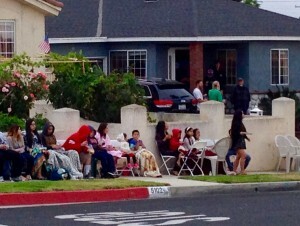 Neighbors line up their plastic chairs to watch the festivities. Watching fireworks in style, and trying to keep warm. Evenings are remarkably cool in Wiseburn/Hawthorne. And in my house, the dogs have been offered food. The big one who threw up snarfs his down. The little one doesn’t look at her dish. She’s been hiding in the bathroom for the past hour. By 9:00, maybe earlier, the Neighbor on the Left’s band is disassembled—every song they’ve ever practiced has been performed, I presume. But in the interests of promoting neighborhood talent, the teens (and other adults) on the street are offered opportunities in karaoke. A woman croons “Lean on Me.” Enthusiastic teams of girls rise and crowd around the mike to sing together, taking courage in numbers. By 10:30, it’s almost over. 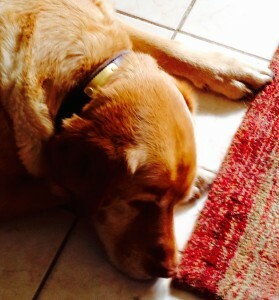 I naively take the dogs for their final walk of the day–thinking things will be fairly quiet. The little one doesn’t agree that it’s safe, and she’s right—occasionally there are still booms. She strains at her leash so hard that, did I not weigh 15 times her weight, I’d have been pulled to the ground. The old, big dog does his business; the little one does nothing. The lawns and streets are covered with debris—bits of paper, cardboard cylinders, black plastic tubes, and ash — whatever is left after a firecracker explodes. 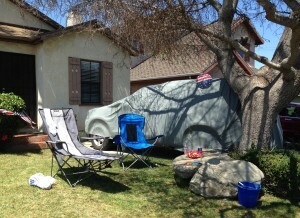 Tomorrow will be a massive cleanup day. Now, I wonder, what will be the condition of my car’s paint, for it’s necessarily parked on the street alongside all the fanfare? I start to prepare for bed. Bursts, at gun-shot volume, continue for some time. A sleeping pill helps. In the morning, there are three more vomit piles on the living room rug. Ugh. I wonder if anyone’s considered earplugs for dogs so they, too, could appreciate that the Land of the Brave is another year older.